To create their fish as part of The Roanoke Valley Rocks campaign, Kennametal held a design contest among employees and their families. All the employees were able to vote for their favorite design. The winning design was created by Laura Arthur, wife of Kennametal employee Cecil Arthur, who incorporated the company colors of gold and black, as well as the Kennametal logo. 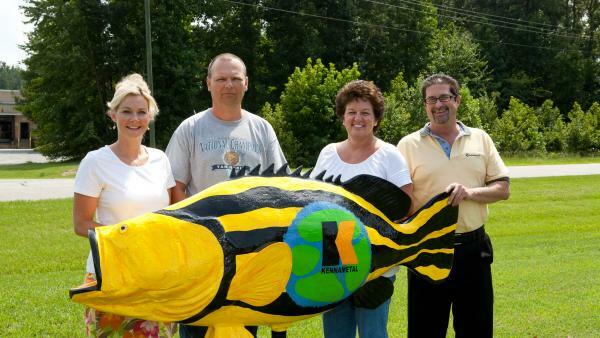 The winning design was then given to local artist Jane Deese, who painted the fish according to the design. Locally, Kennametal employs approximately 145 workers who make cutting tools. Kennametal Inc. delivers productivity to customers seeking peak performance in demanding environments by providing innovative custom and standard wear-resistant solutions. This proven productivity is enabled through advanced materials sciences and application knowledge. Kennametal’s commitment to a sustainable environment provides additional value to their customers. Companies operating in everything from airframes to coal mining, from engines to oil wells and from turbochargers to construction recognize Kennametal for extraordinary contributions to their value chains. In fiscal year 2011, customers bought approximately $2.4 billion of Kennametal products and services – delivered by approximately 12,000 talented employees doing business in more than 60 countries – with more than 50 percent of these revenues coming from outside North America. Kennametal started in Halifax County at Halifax Community College in 1980 and moved to its current location in 1981.